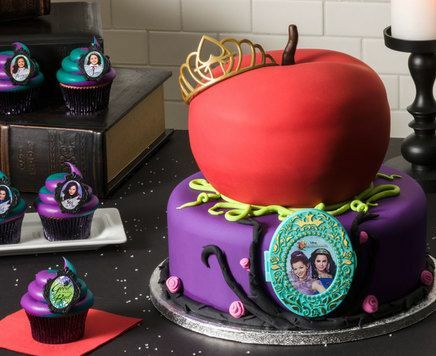 Halloween is almost here, so what better time to create this devilish Rotten to the Core cake based on the recent Disneys Descendants film. This is a really cool idea for children’s’ themed Halloween parties or late fall birthdays. Read below to find out how to make this Disney cake right in the comfort of your home! Fondant ball tool (Amazon sells an entire set at a very reasonable price)-We definitely swear by these molds! Bake your 3- 8″ circular cakes and your 2- 10″ circular cakes and allow them to cool. You can use whatever cake flavor/s you like. Next, get out your 12″ circular cake base and stack the 2- 10″ circular cakes on top of each other. Use your white frosting to create a thick crumb coat base before rolling out and applying your purple fondant. After the stacked 10″ cakes have been covered in the purple fondant, smooth the fondant out and trim off the excess at the bottom. Next, place your plastic dowels in the stacked cakes to provide strength and support to the upper cake layers. After that, stack your 3-8″ circular cakes while adding white frosting in between each layer. Using one of the 5″ corrugated cake boards as your guide, carve down from the top 8″ circular cake to create a spherical shape. Carefully flip the cake over and place the corrugated cake board on the other end of the cake. Repeat the previous process and carve down from the top to create a spherical shape. Your goal is to create an apple shape. Next, use your 1″ round cutter to cut a hole into the center of the cake. Carve divets into the top of the cake to further create the apple shape. Apply a thin layer of crumb coat base and then smooth it out with a plastic icing scraper. After that, roll out your red fondant and drape it over the apple shape. Smooth the fondant out and cut off any excess at the bottom. After the fondant has been smoothed and shined with your hands, place the apple on top of the stacked purple base cakes. Place a bit of white frosting on the front of the purple base cakes and attach the ‘Descendants- Under Your Spell’ cake topper. Next, roll the black fondant into a thin, drinking straw shaped cord. Then, trim the fondant so little ‘barbs’ stick out and make it look like a vine. Take a long, black fondant vine around the base of the purple stacked cakes as a border. Place the 4 remaining vines around the Descendants cake topper. After that, take your neon green gel and your white fondant and mix them together. Use your fondant extruder to make approximately 30″ of green vine. Drape the green vine on top of the purple stacked cakes and twist it together in some areas. Try to make it look like a vine growing around the cake. Next, roll the chocolate fondant into an apple stem shape. Once you have formed the stem, make a small cut into the top of the apple through the fondant. Place a bit of water on the bottom of the stem and gently place it into the apple’s cut. After that, mix the white fondant with the pink gel together. Roll out the fondant and then slice them into small strips. Roll the strips to create flowers and use the scissors to cut off the ends. Place the flowers around the base of the cake on the black vine. Finally, apply the Descendants crown topper to the top of the Rotten to the Core cake. We hope you enjoy creating and eating this fantastic Rotten to the Core cake!